You may have figured out by now that I’m rather ambitious, perhaps tending to the “more ambitious” end of the scale. My parents will laugh. They’d put me squarely in the “overly ambitious” camp. Maybe it’s the fate of a middle child always striving to live up to her big sister or a subliminal, yet strong “do it yourself” imprint from an early childhood experience that left no conscious memories. Whatever the reason, my personality has strong competitive and perfectionist streaks. They’re not always my best attributes. I’ve been told I expect too much of myself, but I don’t know how to set lower standards. My biggest regrets in life (thankfully there aren’t many) are times when I tried to loosen up; times when I pretended I wanted something less than I knew I actually did. Needless to say, that ambition spills over into my baking. 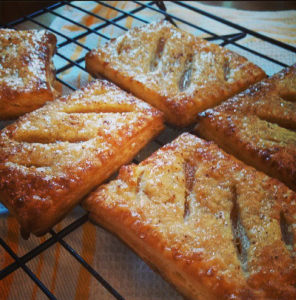 * I think little of making buttery, flaky hand pies from leftover pastry dough and honey baked nectarines on a Tuesday evening, and view preheating the oven to 400° on a hot and humid summer day as a necessary sacrifice for a couple tasty-looking instagram shots and a good dose of personal satisfaction. But a casual comment from a friend last week reminded me not to get so ambitious that I lose you. Many of you probably don’t bake from scratch multiple times a week and wouldn’t dream of turning on the oven when the temperatures soar. So, for the benefit of the less ambitious bakers, I’m doing a little experiment this week. Here’s the deal: I went to my local grocery store and picked up several common brands of boxed brownie mix. You know the ones: pour powder into bowl, add oil and eggs, mix, and bake. Chances are you either have a strong brand preference, or you just grab whichever one is on sale. But what if one is really better than all the rest? Or what if with a few easy deviations from the directions you could make something that tasted more like you had baked from scratch? I thought I could help. The results of this little home baking experiment surprised even me. My bias against boxed mixes led me to assume that they’d all be pretty “meh”, and that none would really stand out above the rest. Instead, I can tell you without a doubt that if you are short on time (or short on kitchen tools because they’re all getting packed away in boxes) grab the premium branded Ghirardelli brownies. 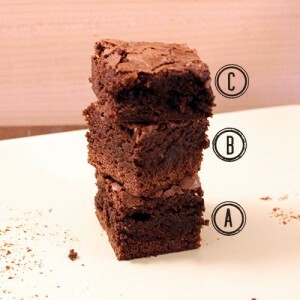 Below, are my opinions of the three brands and a few simple changes to make your boxed brownies taste a little less boxed. Don’t you dare reach for this box! Avoid it at all costs. I don’t care if it’s on sale for $1.06, there’s a reason. This brownie is everything a brownie is not. It smells vaguely like plastic, and it’s sticky and greasy to the touch. It’s overly sweet with zero discernible chocolate flavor. The texture is chewy in a pureed baby food sort of way; and although there was a shiny crust on the brownies, it strangely added nothing new in the texture department. This was the tallest brownie in the bunch. Mr. R kept saying it looked like a cake, and that came through in the texture. These brownies had a drier texture that surely leaned more towards cake than fudgy brownie. I could actually taste chocolate in these; albeit of the lethargic, mediocre cocoa powder variety. The crust was shiny, and added a nice bit of crunch to the top of the brownie. Pillsbury decidedly falls into the “meh” category I was expecting when I started this experiment. With the premium branded label and addition of real chocolate chips in the mix, I admit this one was starting out with an unfair advantage; but I wanted to see if the Ghirardelli name made any difference, and it proved to make more of a difference than expected. These brownies were the prettiest and most “browniest” ones to look at and to eat. They stayed flat instead of puffing up like a cake, and they had a shiny even crust across the whole pan right to the edges. They had a fudgy brownie texture, and they tasted like chocolate even if you didn’t get a chocolate chip in every bite (there were probably less than 1/4 cup of chips in the whole box). I still think they were too sweet and rather one-note, but if you find yourself staring down boxed brownies in the baking aisle, please don’t waste your time and just grab this one! 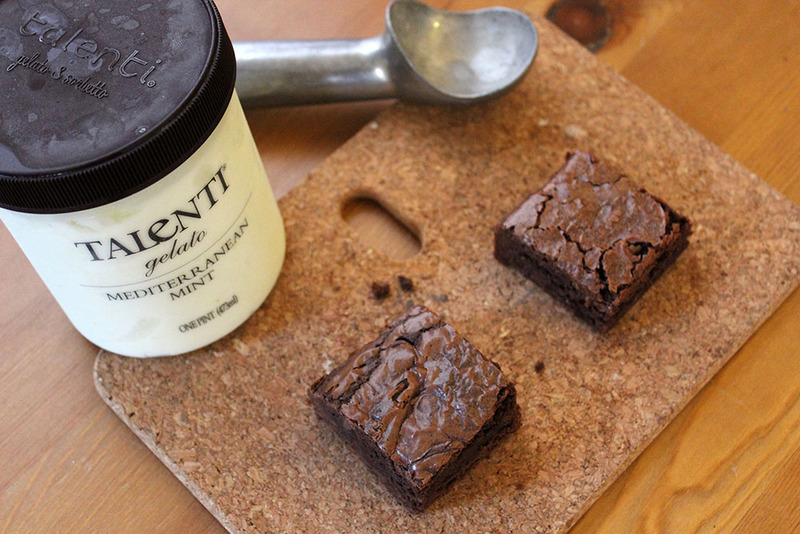 With a few simple swaps, you can in fact make these brownies a bit better. The goal here wasn’t to reinvent the box, but rather to see if some simple changes that wouldn’t add too much extra work or extra dishes (because what else is the point of boxed brownies?) could improve the product. In place of the oil, use 5 Tbsp real butter melted in a microwave or on the stove with 2 oz unsweetened baking chocolate. Pour the butter and chocolate into a liquid measuring cup and add coffee* (or water) to a total volume of 2/3 Cup. Add in 1 tsp vanilla extract and use 2 eggs instead of 1. It’s helpful to whisk the eggs up a bit in your measuring cup before adding them to the batter. The batter ended up being thicker and needed to be spread to the edges of a pan with a spatula. Baking time was about 10 minutes less (~30 minutes). The result was a brownie that stood a bit higher and had both enhanced texture and chocolate flavor. Still fudgy, but with a bit more integrity that made it easier to cut and more pleasant to eat. The texture was still chewy while lacking the white-wonderbread-dough-ball effect. The extra chocolate didn’t necessarily increase the chocolate flavor, but helped pull it away from sugary sweet to something a bit darker and complex. In the end, it’s still a boxed brownie. To tell you the truth, the average brownie eater probably won’t notice the subtle differences; but improved or original these were far ahead of the other contenders. If you really want to impress people, be sure to serve them with fresh mint ice cream*! Three brands of boxed brownies were acquired, and an effort was made to pick out comparable fudge style recipes based on package advertising. Betty Crocker Fudge Brownie mix weighed 18.3 oz and cost $2.19, Pillsbury Chocolate Fudge mix weighed 19.5 oz and cost $2.89, Ghirardelli double chocolate mix weighed 18 oz and cost $2.99. All brownies were baked according to directed temperature and time on the same day with the same source of eggs and oil. Ingredients were mixed by hand with a whisk. Brownies were baked in an 8×8 nonstick metal pan lined twice with foil on a rack positioned in the middle of the oven. *Probably my most ambitious moment was Inspired by this nytimes article, when I baked over 1000 cookies for our wedding guests with some help from wonderful family and friends. No regrets. It was awesome! *You won’t taste the coffee, but a little coffee helps intensify the chocolate flavor. *I make mine by steeping fresh mint leaves in the milk, not with extracts. The first taste can be a transcendent ice cream experience. 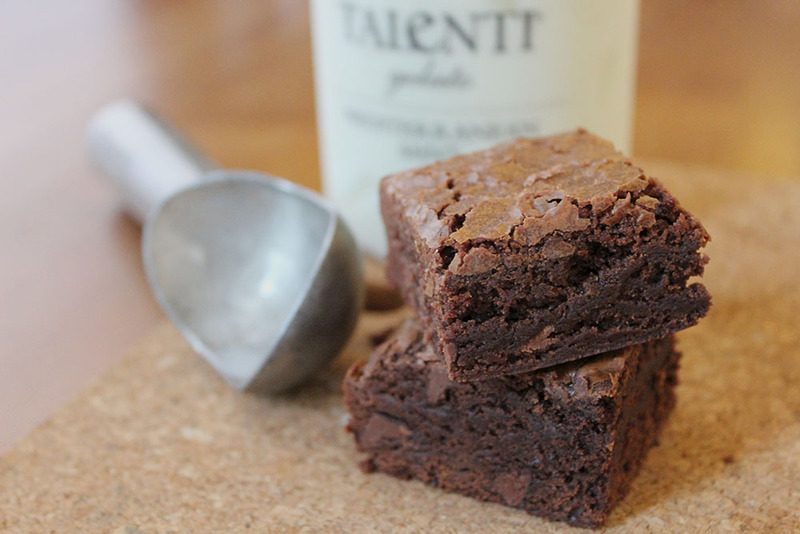 10 Responses to "A Boxed Brownie Experiment"
Awesome. I love your blog posts. Yes, indeed, the wedding cookie table was amazing, even if I did think you were nuts! And “over- achiever”? Yea! hehe…I love your methods section. You’re not taking a break from writing your scientific papers, are you?! Great post! I love “experiments”! 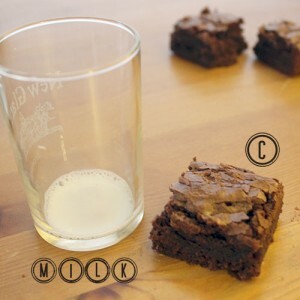 brilliant post…i always wondered what the other brands baked up like…i never make brownies from scratch, because the Ghirardelli are too good and easy, but WOW thanks so much for the tips on making them even better. C is my fav brand too. Do you know what I can add into the Ghiradalli mix to make it less sweet but still retain that brownie chewiness? I’m thinking maybe a bit more flour & water, or unsweetened pumpkin from a can, or more unsweetened chocolate chips… I don’t know …. Thanks so much for this! (And thank you, Google, as well) — I’ve been longing for a way to jazz up the Ghirardelli mix! We follow the modified directions and added about a third of a cup of water to that. We pour the batter into cupcakes pans and out came out rages Lee delicious brownies that were easy to get out of church. We left them in for 29 minutes and that was perfect. Thank you so very very much!